THE SHRINE OF Shiekh Nurud-din generally known to Kashmiri as Alamdar- e- Kashmir is venerated by people of all faiths in Kashmir. Many people in Kashmir consider him as the symbol of secularism, tolerance and respect for all religions. He was an ardent upholder of Sufism in Kashmir which conveys the message of love, tolerance and brotherhood among people of all faiths. Hindus call him Nund Rishi. But even the burial place of this great apostle of humanism and a saint of high spiritual qualities was not spared. It was selected for perpetration of all those negative qualities like hatred, destruction and humiliation of mankind which the saint abhorred throughout his life. Around this place life property and hope of human beings was razed to ground. The question is who is responsible for the tragedy of Charar - -e Sharif and the destruction of the khanqah of Nund Rishi, the patron saint of all kashmiiris? No religion, organization or law has permitted the use of mosques shrines, hospices, temples and gurudwaras for personal or political purposes in any form and shape. It is extremely important for political organizations and leadership in Kashmir that they persistently discourage recurrence of events like those in Dargah Hazratbal and Chaar-e- Sharif. We must learn lessons from history. Islamic history tells us that when Abdullah ibn Omar sought refuge in the Holy Ka`ba, Hajjaj ibn Yousuf hurled fire containers on it (cannon balls were not known then and instead stones and fire containers were thrown on the enemy). The Holy place caught fire. When the Kharijis took control of Ka`ba in 191 it was declared that within the Holy premises, life of a living being including the flying birds will not be taken. Despite this binding which is the part of Islamic tradition, the joint commando force of Saudi Arabia and France forced their way into the Holy Ka`ba, fought with the Kharijis and killed nearly 150 of them during the days of Z.A Bhutto and Ziau`l- Huq in Pakistan, mosques, and the Shahi Mosque of Lahore in particular, were used by people for political purpose. Pakistani police and security forces came into action, used batons and bullets on people and chased them away from the places of worship. In 1993 people of a particular religious sect in Texas, USA, took some women and children as hostage. The state power reacted and F.B.I encircled the entire building. Nearly two hundred persons were burnt alive in the fire which broke out as a result of gun fire during the rescue operation. The victims included some women and children. All these instances show that sensible organizations, political or religious, and far sighted leadership oppose and condemn the use of religious places for any purpose other than of worshipping. We should also find out whether any freedom movement anywhere in the world has ever put Holy places, mosques, churches or temples under siege in the course of its struggle in order to achieve political ends. Islamic history has no record to show that Muslim ever turned mosques into trenches. In fact Muslims have invariably avoided carrying their fight to the mosques with the main objectives of preserving the sanctity and structure of the place. Even the most brutal and rapacious invaders have allowed mosques, temples, churches and other places of worship to be used as refuge by women, children, aged persons, handicapped and even unarmed young men. The Holy Prophet (PBUH) has strictly forbidden the use of mosques for purposes like hatching a conspiracy, propaganda or backbiting. He had ordered the burning of Zawwar mosque in Medina because he had come to know that it was being used for backbiting, conspiracy and propaganda. Islamic thinkers agree that a place where conspiracies are hatched against humanism, human being and society, cannot be called a holy place. We have already alluded to events that took place in Mecca in 1991, it is incumbent upon Muslims that they do not allow desecration of Holy places because the Holy Quran says “You religion and we have our religion. “Therefore we must condemn the misuse of Golden Temple in Amritsar and we must also condemn the destruction of Babri Masjid. But at the same time we must also condemn Mahmud Gazhanavi`s attack on Somnath temple. In retaliation to the happening of Babri Masjid and Charar-e- Sharif, we should not have burnt the temple to indicate sense of revenge. By burning and destroying the temples, we have committed the same crime which the extremists had committed by destroying Babri Masjid or which the Hezbul Mujahideen or Indian security forces committed by burning Charar-e- Sharif. It is natural that we Kashmiris are somewhat sentimental in the case of Charar-e- Sharif. It was the holiest symbol of Kashmiriyat and brotherhood. But as a living nation we shall have to take stock of our mistakes since we are passing through one of the worst phases of our history. We are caught between two rising religious extremist movements in the sub- continent. History will not spare us if we chose to become sentimental or allow to be swayed by the overpowering blind enmity when we should actually make some introspection. We must call to book those who, while claiming that they want to liberate Kashmiris, take refuge in religion by turning mosques and hospices into trenches and in the process inviting Indian security forces to desecrate them. Shall we achieve freedom by burning bridges, schools, colleges and health centers? Indeed it appears that like Afghanistan, Kashmir is also heading towards destruction caused by unbridle fratricide. Factional fighting in Afghanistan has not only taken a heavy toll of human life but has also brought destruction to hospitals, bridges, schools etc. all in the name of Islam. Mosques and places of worship of fair antiquity have not been spared. This tragedy is being re-enacted in Kashmir. In the case of Charar-e- Sharif, we should try to come out of peculiar mindset stimulated by false propaganda, self made religious war, blind enmity and stupid friendship. We should care for an analysis of the situation based on logic and facts. We shall have to bring under scrutiny the statements and action of religious extremists. Indian and Pakistani agencies and politicians, some political parties, their leadership and militant groups in Kashmir, all have become prisoners of their mindset. In the process they have imposed a ban of sorts on the solution of problems to Kashmiri, their freedom of expression and the opportunities of their economic development. However not succumbing to any of these infirmities, I have taken upon myself to speak my heart to the common man and women in Kashmir with the sole purpose of helping them in their search for truth. This statement of Mast Gul explains two things. First the real inheritors of Kashmir, meaning all Kashmiri inclusive of believers in different faiths, are all “traitors and Indian agents” because they want independent Kashmir. Second, the process of resolving Hazratbal crisis peacefully and saving that shrine from destruction is characterised by Mast Gul as “selling of conscience.” Furthermore the activity of Mast Gul in reducing Charar-e- Sharif to ruins is ruins is called “a heroic deed.” From this will not the people of Kashmir who love every inch of their land, infer that the plan of destroying Charar-e Sharif, or getting it destroyed was drawn by foreign armed men? On March 13 1995 and again on March 27 Indian officials had agreed to ensure safe passage to Pakistan of all armed men holed up in Charar-e- Sharif. This offer was also formally announced. It should be reminded that in the case of Hazratbal siege all armed persons whom safe passage was promised were eventually set free. One of them belonging to POK was safely sent back across the border, Mast Gul and his companion had rejected this offer. But by not permitting the Hurriyat Conference leaders and international press to enter Charar-e- Sharif Indian security forces took upon themselves the blame of destruction and desecration of Charar-e Sharif. In any case, we shall have to analyses how only the extremists benefitted from the tragic events. Sharif tragedy scuttled that program me. Deepened religious hatred could become conducive for the fragmentation of Kashmir. By destroying Charar-e- Sharif it was intended to convince Kashmiri Muslims that their religious places and shrines were not safe anywhere in India. This would induce Kashmiri to get entangled in a religion based war instead of carrying on their liberation movement. By citing the example of Charar-e- Sharif tragedy more fuel would be added to Babri Masjid episode. The Indian Muslims would be further sensitised to religious hatred. And the most significant achievement of this action was the creation of dissatisfaction of the Muslim world towards India. These were the gains which the extremists in Kashmir may imagine they made from Charar- e- Sharif incident. But sensible people and government’s world over consider it a wrong thing to utilize places of worship for political purposes. Charar-e- Sharif destruction could therefore produce no tangible result for the freedom movement In Kashmir. May be it raised higher the wall of inter religious hatred: maybe it provided religious extremists added manpower to fill their ranks. These transient gains might have induced Harakatul Ansar to impose a ban on the Hindu pilgrim ageing to Holy Amaranth. And in doing so, the extremists unwittingly provided support to the Indian stand that the ongoing strife in Kashmir was nothing but a religion based struggle launched by religious extremists who had sought physical assistance of Afghans and Pakistanis. A reputed Kashmiri pandit scholar and human rights activist participating in the UN Human Rights Commissions session in Geneva, made an intervention in which he raised the issue of the safety of pilgrims anywhere and everywhere in the world while citing the example of a ban and attack on Amarnath pilgrims in Kashmir by religious extremist groups. Thus a new area of human rights violation was brought to notice which caught the attention of the Human Rights Commission. In Pakistan or in Kashmir those who want to characterize the ongoing struggle as a religious war should remember that if they consider it a great victory for the religion to take a stretch of land 100 miles long and 60 miles broad then who will save the life, property and honour of twenty corers of Muslims in India from rapacious hands of religious extremists? What is the condition in Karachi of those migrant Muslims (mohajirs) from UP and CP who were instrumental in the creation of a new state based on religion? Which Islam prevails in Afghanistan where a religious war has been launched in contemporary times? Which Islam reigns supreme in that country where hospitals, mosques, buildings, seminaries roads, bridges and all such things are destroyed as are considered civic facilities for the populace? What service is being rendered to Islam by embarking on a large scale fratricide? The case is not much different in Kashmir. After the Charar-e- sharif incident, more than 100 houses 30 temples. 50 schools and over 90 public building and healthy centers were systematically destroyed. What service did this massive destruction has rendered to Islam? Is it not the personal loss of Kashmiri people? Despite the formidable presence of Indian security forces around Charar-e- Sharif town, Mast Gul and his accomplices managed to escape along with their machine guns and other arms. It sprung a surprise on inquisitive minds. The sensational escape made a common Kashmiri prisoner of hero- worship. In order to cash upon it, Jamaat-e- Islami gave a hero`s reception to Mast Gul and his companions. PPP circles in Pakistan and the Chairman of Kashmir Committee, Sahibzada Nasrullah Khan, made a loud protest against the tumultuous reception arranged by Jamaat-e- Islam for Mast Gul and company. Armed and equipped Mast Gul contingents return to a hero`s welcome in POK was the vindication of India`s stand that Afghan and Pakistani mercenaries were fighting in Kashmir with tacit and open support of Pakistan and that they were receiving funds and arms from that country. European diplomatic circles, instead of calling Mast Gul`s escape scandalous for Indian security forces, considered it India`s political victory. UN Human Rights Commission was meeting in Geneva at that point of time. 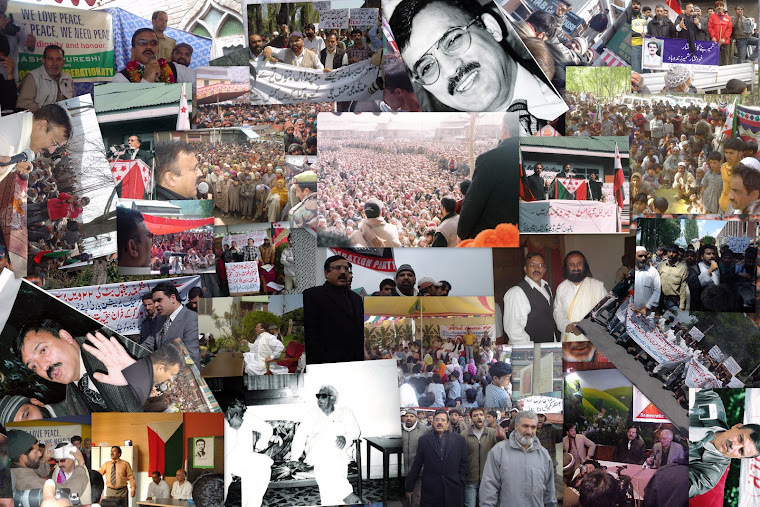 According to political pundits assembled there.”Indian political and military leadership deliberately allowed Mast Gul and his accomplices to escape because they knew very well that he was a Pakistani national and that on his return, Jamaat-e- Islami workers and emotional Pakistanis would accord him tumultuous reception in order to raise more funds and inject another dose of euphoria into the mind of unsuspecting masses. This chain of events would reinforce India`s contention that Pakistan was fully supporting and assisting terrorists. Precisely the same thing happened. Pakistani newspapers and tabloid press splashed across the front pages colored and magnified pictures of Jamaat-e- Islami`s reception to Mast Gul and company. His speeches were published in bold headlines. All this energized Indian postulation. The story of Mast Gul`s Quixotic adventures appearing in Pakistani newspaper was widely disseminated among foreign missions and international political circles. In POK and Pakistan, emotionally surcharged people called Mast Gul`s escape from the Indian security net as his heroism and India`s debacle. It is worth noting that in 1990 – 1991 when Kashmiri militants were crossing the border, anything between 40 to 60 of them would get martyred every day at the hands of Indian security forces. At a place called Chakothi (on the line of actual control along old Jhelum Valley Road) there is such a large concentration of troops on both sides of the border that not a bird can beat its wing. How come Mast Gul and his accomplices could cross over at that very point and without anything untowards happening to him ? sections of sensible Pakistani political commentators scorned Mast Gul fever; they also criticized Jamaat-e-Islami`s stance on Mast Gul affairs. Interestingly, Sardar Qayyum Khan expressed his total disapproval of reception rallies and demonstration of arms asserting that it was tantamount to inflicting inadvertent damage on the freedom movement. A very important question arises here. People of Kashmir and their leadership shall to substantiate the purpose they wish to serve by making armed foreigners their” guest mujahids” and through them getting schools and bridges burnt and shrines captured by force of guns and then got desecrated. Will those people help our movement who, acting in the name of religious extremism, turned their own country Afghanistan into a vast ruin reducing its hospitals, schools and mosques to rubble? Will they not in the wake of what they did with their own country, push Kashmir to medieval ages and abandon her to regressive and retrograde forces? If Kashmiri masses and Kashmiri leadership do not discourage inclusion of armed Afghan and Pakistanis in their struggle, then a day will come when they will have to pay a heavy price for this Himalayan blunder. The practical example of Afghanistan should not be lost sight of. 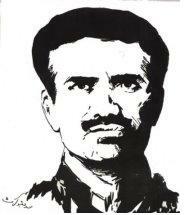 From the very beginning I strongly protested against kidnappings in the course of armed struggle in Kashmir. I had sensed the adverse and far- reaching effects which Dr. Rubiya Sayed`s kidnapping could have on the struggle in Kashmir. That was the reason for me to condemn it. No religion, no ethical code, no law and no precedent allows kidnapping of innocent and defenceless people in a state of war. It is also forbidden under Geneva Convention floor dos and do not`s in a war. It is the act of kidnapping which has labelled our struggle as terrorism. After making the party accept conditions which are invariably of the nature of personal aggrandisement, emotion and euphoric” heroes” make the kidnappings of innocent people their profession. This ultimately brings defamation to the liberation movement besides being blatant violation of human rights. Rubiya Syed`s kidnapping opened the door of this vicious deed for others. It could not be stonewalled all these years. Some people and groups turned their back on lofty objectives and resorted to acts of kidnapping in order to either liberate their fellow comrades or win cheap publicity. Apart from this some individuals and office bearers of some organizations made it an easy way of making money. In doing so, they sowed such a poisonous seed for the activists of Kashmir movement and for our future generations as may have to be reaped by them. An irrefutable and in controversial proof that our movement had become a terrorist movement, was provided by the kidnapping of vice chancellor Mushirul Huq, his secretary Abdul Ghani and the HMT manager Khera. The announcement of Amanullah Khan from New York that the kidnapped persons be finished became the most potent and the most eloquent proof of our terrorism. I had asked Altaf Qureshi, a cousin of mine who was later on martyred, why the JK student`s liberation Front killed Mushirul Huq. He said.’ We took cue from Amanullah Khan Statement from the USA that by now Mushirul Huq may have been killed” and shot him dead. In short, many people have been kidnapped. In some cases a bargain was struck and in other cases, the helpless victims were done to death. On local level, people began to be kidnapped for extracting money or for settling personal scores. Nobody could keep proper record of kidnappings made for petty difference or for not responding to a gun wielding person`s order. Sometimes back, I happened to meet a respectable businessman in Singapore who told me his story. He said,” one day I was dragged out from my office and beaten up on the road. My assailants wanted to extract money from me. At the same time a bearded elderly man was also brought to this site. It was the month of fasting (Ramadhan) and the hour was that of ending of fast. The elderly man made entreaties and wept bitterly before the gun- wielding fellow. At last the fellow told him to clean his shoes with his beard. In order to save his life the elderly man cleaned the shoes as ordered in front of many people.” Such incidents should have been investigation into so that people would not have changed their mood vis-à-vis militants. The person who recounted this incident is physically present before me. He himself has been a victim of oppression. When such incidents occurring to a respectable person in Kashmir were not stopped by the leadership, the gun wielding ruffians became tyrannical, persons like Maulana Masoodi Qazi Nisar, Mohammad Shaban Vakil, Molvi Muhammad Farooq Ghulam Mustafa, Malik Maqbool and scores of other Intellectuals and scholars were gunned down for no sin whatsoever. Even the tourists did not escape their wrath. Some tourists had been kidnapped earlier. But more recently five foreign tourists were kidnapped. Among them were two British one American, one German and one Norwegian. The kidnappers disclosed the name of their organization as AL-Faran. They demanded that their 21 fellow’s militants languishing in Indian prisons be released. Among the arrested persons were Azhar Masood of Harakatul Ansar, Sajjad Akhtar and Abu Jindal. Others were pro-Pak accessionists or belonged to religions groups. Indian authorities have till date refused to concede the demand of the kidnappers. In Kashmir, all militant groups and All Party Hurriyat Conference condemned the kidnapping of the tourists and made appeals to Al Faran to set them free. A sixth hostage who had managed to escape had said that the kidnappers speak pushto and Urdu. All appeals were turned down by the kidnappers. After having kidnapped the tourists, the kidnappers mentioned the name of a religious leader of Pakistan, maulana Fazlu`r Rahman to hold talks for the release of 21 of their outfit against five foreign tourists. Maulana Fazlu`r Rahman is also the chairman of Foreign Relations Committee of Pakistan parliament. In a press conference, he said that the kidnappers had informed him on telephone that they had nominated him their mediator. Immediately after the press conference of Maulana Fazlu`r Rahman, British and American diplomatic officials in Pakistan made an appeal to the Maulana for cooperation and help whereupon the maulana proceeded to New Delhi. The reason given by the Maulana for cancelling his publicized visit to Deoband was that he would be waiting in New Delhi for some message from the kidnappers or from the administration. But when the Indian authorities refused mediation (as claimed by the Maulana) he cut short his visit and returned to Lahore. Surprisingly, the Maulana told the press in Lahore that kidnappers had assured him of not killing any of the hostages as long as he was in Delhi. But then suddenly during the night of July 12, 13, 1995, the kidnappers threw the beheaded body of the 27 years old Norwegian students, Hans Ostro, somewhere near Pahalgam. The severed head was thrown somewhere else. According to post mortem report, the death of Hans was caused by severing his head from his body. By their savagery the kidnappers proved that they were neither Kashmiris nor had they any sympathy with Kashmir cause nor did they know anything about the teaching of Islam. All the kidnapped tourists were not only innocent but were also the guests of Kashmiris. Kidnapping and killing an innocent guest in a barbaric manner is, in no case permissible by morality, law and above all by Islam. According to the Holy Quran the murder of an innocent person is the murder of humanity and above all of humanism. God Almighty has not condoned murder. The holy Prophet (PBUH) has repeatedly commanded that aged and handicapped persons, women, children and men without arms should not be killed. Hans Ostro`s brutal killing has projected all Kashmir’s as barbarians in the eyes of the whole world. A storm has blown all over the world by this dark deed of ours. The tiny ray of hope which the diplomatic circle thinks was there was in the shape of condemnation of the act coming from various organizations In Kashmir. 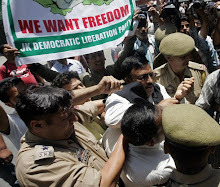 APHC even gave a call for general strike on July 16 1995 so that it would distance itself from the kidnapping and murder. One wishes that the Kashmiri political leadership and organizations had, from the very beginning united all people as it did on July 16 against anti- human acts like kidnapping, murder, arson , fratricide, hurling of grenades in crowded bazaars killing and wounding innocent men, use of arms in the lanes and by-lanes of the city, looting and burning of the houses of pundits, not allowing the exiled persons to return home and many other acts of vandalism. One wishes they had galvanized people into resisting these dark deeds. Had that been done today our movement would not have become helpless nor would it have been called a terrorist movement instigated by Pakistan. The entire movement would have been subjected to political control. Nor would have been our innumerable young people, the apple of their mothers eyes snatched from us. Innocent people small children and women would not been killed or wounded as a result of groups clashed. Journalists would not been intimidated for not publishing news according to the choice of the extremists. They would not have been subjected to attacks, nor kidnapped nor shot at. One more aberration is that all those happening that are beyond our control are labeled as Indian conspiracy. This is not real politic. Kashmir`s true leadership and organization would do well not to succumb to Indian or Pakistani propaganda and start speaking their language. Reaction of Indian and Pakistan rulers, bureaucracy and intelligence agencies to the kidnapping and killing of innocent student can at best are called a tamasha on a dead body. On both sides attempt is made to bring the blame of innocent killing to the doorsteps of the other. In this propaganda campaign even the prime ministers of both the countries have put their share. In the exercise of trading accusations Pakistan states: (i) by engineering the crime, India tries to defame the Kashmir movement throughout the world and label. It as terrorism (II) why is this group in contact with Indian officials only. (iii) nobody has heard of AI Faran and that it is India`s own creation (iv) it is a conspiracy against Pakistan hatched at a time when presser Amendment is being brought up for discussion at the American Senate (v) kidnappers are in touch with Indian authorities. Is it not possible to locate the kidnappers and obtain release of the hostages. (vi) India is making the kidnapping an excuse to initiate a limited war with Pakistan. The arguments advanced by the Indian authorities in support of their contention that Pakistan is involved in the kidnapping are (i) by the act of kidnapping and murder,Pakistan wants to highlight the Kashmir problem in order to mount foreign pressure on her to resolve the tangle. Furthermore, by jeopardizing Kashmir`s tourist industry, Pakistan wants to serve a blow to Kashmir`s economy so that the people are left with no option but to fight the Indians with their back to the wall (ii) establishing contact by the kidnappers with the chairman of Pakistan parliament`s foreign relations committee, Maulana Fazlu`r Rehman and naming him as a mediator ( which he disclosed in a press conference ) is sufficient proof of Pakistan`s involvement in the affair (iii) killing a tourist of a small country and not of UK or USA was to escape the negative reaction by the big power against itself. Had it been the Indian conspiracy then the victim would have been either the Brittan or the American tourist so that there would be a widespread reaction against large number of Pakistanis and POK people living in these two countries. (iv) Pakistan wanted to strike fear in people so that they do not take part in proposed elections. By spreading fear she wanted to hold back those who had shown their inclination for a dialogue with the government(v) if we had hatched the conspiracy then Scotland Yard, CIA and the officials of the State Department would have been a party to talks with the hostage takers and also in the matter of setting them free. British, German and American officials participated in all matters pertaining to hostage taking in Srinagar. Diplomatic circles mock at the propaganda spree and sadist attitude on both sides. People acquainted with politics, governance and intelligence exercises and also those keeping close track of things in the fast changing world know that secret services of none of the Third World countries can muster courage to kidnap a western tourist anywhere for the realization of its particular objectives even if that objectives is lofty or extraordinarily important. The secret of kidnapping and killing tourists can never elude super power. No country is so foolish as to hazard an adventure that may end up in declaring it a terrorist state and the wrecking of its economy. Therefore those who are acquainted with the subtleties of politics good governance and the use state power would naturally reject the stand of either country. In Egypt, Algeria and Tunis, religious extremists have been kidnapping and murdering tourists. All Faran group involved in similar acts in Kashmir is also one such international terrorist group involved in the kidnapping and killing in Kashmir. Their action is in fact their individual action as they want the release of their men who are the activists of Harakatu`l- Ansar and Hizbu`l Mujahideen. Such people cannot be kashmiris. 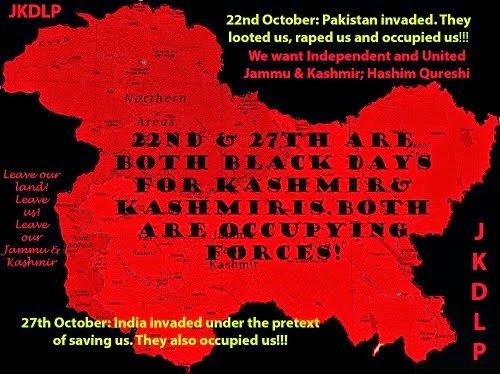 True in the past some Kashmiri groups have also resorted to acts of kidnapping in order to seek the release of their companions but those whose release was sought were only kashmiris. In the AL Faran case release of foreign terrorists is demanded. For these kidnappers individual interest are more important than the freedom movement and the rights of the people. If this report is to be accepted as true, still it cannot be deduced that Pakistani official organizations are involved in the kidnapping and murder. It is possible that on the basis of ideology and religion, the first contact made with Maulana Fazlu`r Rahman might have put the kidnapped persons into contact with the planners of kidnapping. It can also be possible that somebody within the Pakistani organizations might have on individuals level helped the kidnappers in border crossing and related matters by all indications, it appears to be the indivual case of the kidnappers. In the post such incidents have taken place in Pakistan. The fact of the matter is that instead of indulging in the game of one upmanship both the government should have cooperated to stamp out the religious extremism from the sub- continent and also resolved outstanding matters through peaceful negotiations. Past history has shown that the countries or organizations that abet and support extremism of any kind are in final analysis faced with their own Frankenstein. MQM in Karachi has now been labeled as a terrorist organization and ISI and General Zia are held responsible for arming them. Influential circle in Pakistan consider sipah-e-Sahaba also a scourge although the responsibility of arming that organization also rests with official circles in that country, this week, Sipah-e- SWahaba activists attacked and destroyed the office of BBC in Islamabad. Following the example of Pakistan, powerful Indian official circles gave monetary and material support to the Tamil Tigers in Sri Lanka. Then came the day when Indian army had to fight against the very LTTE who also became the instrument of murder of a polished politician and prime minister namely Rajiv Gandhi. Bhindranwale was also the creation of New Delhi based Aakali Dal opponents. India had not only to fight Bhindranwale but had also to enter the Holy temple in Amritsar and allow it to be desecrated. Thousands of Khalistani activists were killed in Punjab during ten year old Sikh uprising. Sant Longowal too had to lay down his life in this turmoil. Punjab Chief Minister, Beant Sing has been killed along with 13 others in a car bomb. In a press conference held on August 29 1995, Benazir Bhutto repeated that the kidnapping of foreign tourists in Kashmir was an Indian plot so that the campaign of branding Pakistan as a terrorist state could be accelerated on international plane. She added that the Brown Amendment is likely to come up before the US Senate in the beginning of September and India might venture killing another tourist simultaneously. Do statements like this merit serious consideration? And if another tourist is actually killed in September, will not Benazir`s statement become dependable evidence to tell the world that kidnappers had to kill another tourist only to prove her true. Who then becomes the real killer of the tourist? There is no doubt that if India accedes to the demand of the kidnappers and sets free their people like Abu Jindal Sajjad Afghani, Maulana Tahir and Azhar Masood, the freed men will go back to Pakistan as Mast Gul went because the headquarters of their release will also pack up and go to Pakistan to ensure it remains secure or at the best proceeds to Afghanistan. In that case, how will Pakistan face the world, western countries and the people of Norway? For two years in the past, Indian politicians and administrations have been speaking of holding elections in Kashmir. Proposed elections had to be deferred owing to the happenings in Dargah Hazratbal. After some time the matter came up once again but only to be scuttled as a result of Charar-e- Sharif incident. Kashmiris feel betrayed when no proper and impartial enquiry into the incident is ordered. Kidnapping of five foreign tourists and beheading of one of them has brought more complications to political atmosphere and has increased the difficulties of the people. From all these developments, only one thing can be safely deduced viz. there are external forces who do not want Kashmiri to be independent and decide their own fate themselves. Pakistan considers Kashmir a question of her life and death. A high level Kashmir Committee has been constituted in that country. According to sources in Pakistan nearly four million dollars, 12 crore rupees, are spent by Pakistan on Kashmir each month. ( it is a different story that out of this amount 90 per cent is invariably misappropriate which is encouraging for the Indians) the prime minister of Pakistan speaks about assistance to kashmiris. In a scenario in which the entire Pakistani nation has been made a hostage to Kashmir issue, how can we think that Pakistan and militants in Kashmir would like the election process to be initiated in Kashmir. I cannot understand why Indian authorities and bureaucracy are avoiding tripartite talks on Kashmir. They do make offer of unconditional talks with Kashmir leadership. At the same time they express their readiness to talk with their Pakistani counterparts in accordance with Simla Agreement. Does it not mean that Indian authorities indirectly accept that Kashmiris as well as Pakistan are parties to the Kashmir issue? Pakistani authorities too, have not as yet come out in open support for tripartite talks on Kashmir. All they say is that APHC can also join the talks. But Hurriyat is a union of some parties in Kashmir only and that too incomplete one. Jammu and Ladakh are not represented in it. Indians would do well to realize that Pakistan is a party to the issue. Pakistan army and administrators have their jurisdiction over Azad Kashmir, Gilit and Baltistan, which are the areas of the state of Jammu and Kashmir. Supporters of independent Kashmir want to see all the five regions of the state liberated from the control of both the countries. That is the reason why people consider Pakistan an important partner in the dispute and not because Pakistan has grabbed the Northern Areas and Azad Kashmir. Eventually the people of Jammu, Ladakh and Kashmir valley region will, in a prospect of tripartite talks hold talks with India and those in Gilgit , Baltistan and Azad Kashmir will speak with Pakistan’s. the talks will focus on the question of self determination of each region. But the simple logic is that unless people on two sides of the line of actual control meet, the talks cannot progress. The tangle cannot be resolved either by war or by militancy. The issue is to be resolved in the spirit of Israel- Palestine or Great Britain Ireland conflict resolution process. The three parties can as well enter into secret negotiations in the first stage. They can agree on holding elections on both sides of Kashmir under the supervision of an impartial authority. This would provide a representative body for the entire State of Jammu and Kashmir which could then be called the real real representative delegation of Kashmiris in the ensuing tripartite talks.